How do I program my xr11 remote to my TV? Here is a list of TV codes that will work with the XR11 Cox or Xfinity remote. You will need the remote code for your television, and you will need to understand how to program the XR11 remote. Once you have the TV code, we will show you how to program the XR11 remote to your tv with ease. If you have installed a new TV but you are still using the same XR11 remote control with your cable TV setup, the XR11 remote will not work with the newly installed TV. You won’t be able to turn the TV ON with the XR11 or change the volume of the TV without reprogramming the remote. 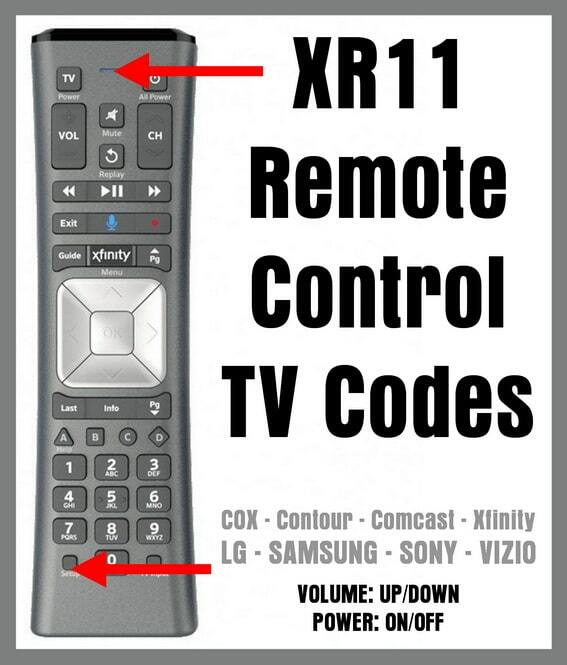 Here is the information that will show you how to program your XR11 remote and the TV codes needed to control volume + or – and power ON and OFF on your TV brand using the XR11 remote. You will first need to find the remote codes that are for your specific TV manufacturer. 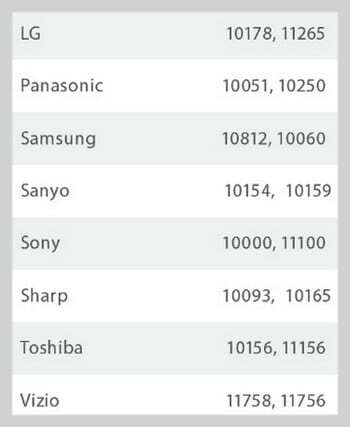 Here is a list of the most popular TV brands and the code you need to make your TV work with the XR11 remote. 13559, 11687, 12964, 12260, 13907, 11886, 11864, 12183, and 10178. 12731, 10178, 10856, 10700, 10442, 10017, 12271, 11314, 11032, 11758, 12246, 10032, 11178, 11265, 11993, 11934, 11637, and 11530. 11480, 10650, 10051, 11947, 11924, 11310, 10226, 10375, 11410, 11271, 12269, 11919, 11347, 11290, 10178, 10165, 10162, 10250, 11941, 11927, and 12273. 12051, 12280, 12281, 11903, 11060, 10587, 10329, 10482, 10650, 10814, 10032, 10178, 10030, 12284, 10812, 11632, 10702, 10060, 11959, and 10766. 10810, 11100, 10834, 11685, 11791, 11786, 11400, 11925, 11904, 10011, 11317, and 10353. 11758, 12707, 12512, 10864, 10885, 10178, 12247, and 11756. Once you have the TV brand remote code, use the step-by-step list below. 1 – Turn ON the TV you will be using with the XR11 remote. 2 – Press and hold the SETUP button (bottom left) on the XR11 remote until the LED status light (top of remote) flashes from Green to Red. 5 – If the 5 digit code you entered did not work, keep trying the numbers in the TV brand code list until you find one that programs the remote to the TV. Once a successful code is entered, verify that TV power, mute, and the volume + and – buttons function properly. If you cannot find a code for your brand of TV, use the code search method below. 2 – PRESS AND HOLD the SETUP button (bottom left) on your XR11 remote until the LED status light (top of remote) flashes from Green to Red. 3 – Begin manual TV code search by entering 991 on the XR11 remote. 4 – The LED status light will flash Green 2 times. 5 – Repeatedly press the CHANNEL UP button on the XR11 remote to search through the TV codes. 6 – Keep pressing CHANNEL UP button on the XR11 remote until the TV you are programming turns OFF. 7 – After your TV turns OFF press SETUP. 8 – The LED status light on your remote should flash Green 2 times. 9 – Press the TV Power button on the XR11 remote and if the TV turns ON, your XR11 remote is programmed. Be sure to hold the SETUP button until it flashes Green 2 times after your TV turns OFF. NOTE: The XR11 voice remote is used with different cable TV providers. Some such providers are COX (Contour) and Comcast (XFINITY). The following information will also work on the X1, XR2, and XR5 remotes. For Xfinity XR-11 remote use code 32467 for Yamaha RX-V665. It solves the problem many have blogged about. It powers on and off the stereo unit along with volume control.